Creating the picture perfect nursery is all in the details. This customized skirt will give the crib a polished, finalized look. The skirt adds a touch of softness to the crib by hiding unsightly storage and hardware. We have all the tools at your disposal to create a head to toe crib that is tailored to your personal design aesthetic. The 4-sided crib skirt is split at the corners for easy placement. Or system offers the freedom to create 4 identical, or 4 entirely unique sections. This crib skirt center is made of microfleece with the 4 separate sections made of 100% smooth minky like fabric. While in use the skirt has an ideal 15" drop. Designed to touch the floor when the crib is at it's lowest setting. 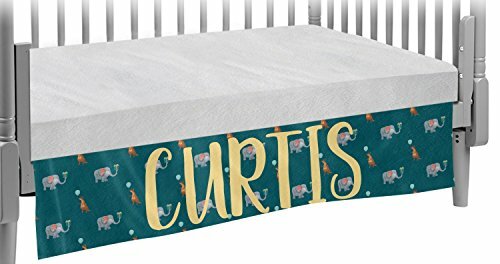 Your custom crib skirt is durable, machine washable, and fits all standard cribs.